25 Best Maui Snorkeling Spots & Beach Guide | Videos & Photos! Honolua Bay is just beautiful! You’ll take a forest path to reach the beach, and if you had any worries, they’ll melt away as you gaze in awe at the giant plants along the path and listen to the murmurings of the resident chicken flocks. The bay is bordered by a beach full of large smooth stones. There is no sand to speak of. In calm weather, this bay hosts snorkelers and divers, but when there is a swell coming through, the surf goes off at Honolua Bay! Check the Maui snorkeling conditions before you drive there. Both sides of the bay boast a well established coral reef with great marine life. You are likely to see peacock groupers, butterflyfish, yellow tang, Moorish idols, and occasionally a manta ray or octopus! Turtles are seen here occasionally, as well. Because fresh water is entering to mix with the salt water in Honolua Bay, in some places the underwater world looks wavy – a bit like when water streams down your windshield in a car wash.
Get into the water by going off the old boat ramp on the right hand side. At the shoreline, the bottom is covered with rocks. The ramp and the rocks beyond are very slippery, so take your time. For your comfort, float as soon as you can, and then push out to check out the fish! The beach is made up of large, smooth, round rocks. Though beautiful, it is not super comfortable to rest on. The ‘aina (land) surrounding Honolua Bay is maintained by a man named Uncle Jimmy. If he is there when you are, and you have the time to sit and talk story, he has some incredible tales and history to share. If you want a big mahalo, leave a tip for Uncle Jimmy on your way out; it’s a nice exchange for all the upkeep he does on the beach and trail, and for keeping an eye on people’s cars. Don’t bother swimming to the left at Mokuleia Bay; there’s nothing interesting there. Go right, and you are likely to see turtles, large parrotfish, cornetfish, Moorish idols, and needlefish, among others. Watch yourself around the rocks that jut above the surface, and you will love this site. Even in spots where there are no fish around, the huge boulders make you feel like you’re in an ancient underwater city. Enter on the right hand side and take your time, starting with plenty of space between you and the boulders. Walking in, the sandy bottom is made of abrupt hills and valleys. Once you’re in, pay attention to the current pushing north. You can actually explore the right hand side of Mokuleia Bay and keep going north around the point into Honolua Bay – another gorgeous snorkel site! The beach at Mokuleia Bay is sandy, beautiful, and wild with no amenities, so if you like roughing it, you’ll enjoy spending time here after you swim. You can rent beach umbrellas, chairs, coolers, boogie boards, and more! The crescent-shaped Kapalua Bay is just gorgeous, whether you choose to get into the water or get some sun on the sand. Both sides of the bay have lava rock formations housing all kinds of marine life. This cove is generally calm – a very good snorkeling site for swimmers of all ages. The left side (when facing the ocean) is full of sea turtles in the early morning, and the reef is very nice at the far end. The right side has a lot of fish, including needlefish, baby parrotfish, humuhumunukunukuapua’a, and several species of butterflyfish. As on the left side, the far end of the right side has the best reef. The center of Kapalua Bay is all rolling sand that the waves pattern beautifully. Enter the water on the left side. There, you’ll find gently sloped sand – perfect for taking your time putting on your gear and getting the kids ready. The right side is rocky and quite shallow close to shore, so be careful – not just for your safety, but for the safety of the living reef, too. Avoid any scrapes by getting out of the water on the left side. Napili Bay caresses a lovely arc of golden sand on Maui’s northwest coast. This bay is known to play host to bodyboarders, surfers, paddle boarders, and swimmers. The Sea House Restaurant rests beautifully at the north end of the bay, and several small resorts line the rest of the beach. Sea turtles are especially prevalent here at sunrise and sunset – great timing for you to take photos from shore. The fish congregate near the edges of the bay, where the reef has grown and their food and territory are located. If it’s encounters with marine life you’re after, the left side of Napili Bay is more interesting than the right. You will see needlefish, humuhumunukunukuapua’a, brown surgeonfish, and sometimes turtles. The center of the bay is all sand and, though a beautiful place, it is rare to see any fish there. You can enter Napili Bay almost anywhere on the beach, because the entire shoreline is sandy. Just an FYI: on both sides, you will find several concrete slabs – sometimes in very shallow water – about 10 yards from shore. If there is a lot of surfing going on here, it is a great day for surfer watching, but not so much for snorkeling. The great waves for them mean poor visibility for you. Napili Bay is a good place for kids to run around, play with boogie boards, and dig in the sand. Nowadays, the Airport Beach pavilion marks the site of the old airport terminal, and the snorkeling off the beach is exceptional! The reef just offshore is part of the Kahekili Herbivore Fisheries Management Area, a partially protected underwater space since 2009. Certain types of algae-eating fish cannot be taken in this spot, and the reef has enjoyed improved health because of it. You will love swimming through this thriving ecosystem! Underwater, you are sure to see black triggerfish, humuhumunukunukuapua’a, unicornfish, and yellow tang. This is also great habitat for bluefin trevally, goatfish, and eels! The coral reef here extends in all directions, and you’ll find it almost as soon as you get into the water. You can enter anywhere the sloping beach sand continues into the water. Look for a light turquoise color, and walk in there. (The dark color you see below the surface is coral reef, and very fragile.) The best thing to do is find a sandy spot, walk in, and then float on your back while you get your gear ready. That way, you’re comfortable, and so is the habitat you’ll be exploring! 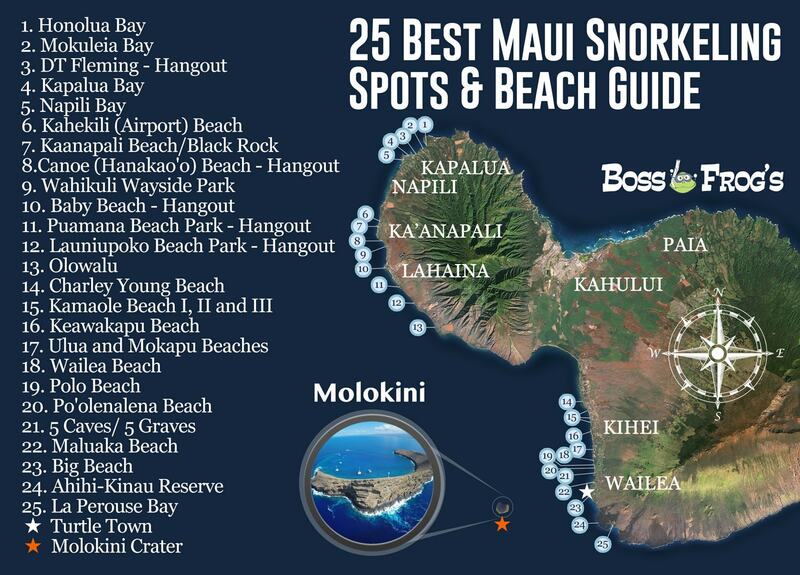 This is one of the most popular snorkeling spots on Maui. Every island in the Hawaiian chain has a place where the ancients believed that souls leapt into the afterlife. Black Rock, known in Hawaiian as Pu’u Keka’a, or “Rolling Hill,” is Maui’s jumping-off point. It is also home to a coral reef that is a lot of fun to explore. During whale season, Black Rock is a great place to hear whale song underwater; the incredible sounds bounce off the lava formations there. Most of the fish are both close to Black Rock itself, and in a little cove around the rock to the right. You will always see trumpetfish, the Hawaiian state fish, brown surgeonfish, and different types of butterflyfishes. There are also large schools of goatfish hanging out along the bottom, half asleep. If you are there at just the right time, you may see Hawaiian green sea turtles, the harmless blacktip reef shark, or an unbelievably cool formation of spotted eagle rays! Enter about four yards to the left of Black Rock, in a sandy area. There is a lot to see just on the left hand side. If you want to check out the cove, too, keep some energy in reserve for your return trip. Sometimes there is a current you’ll need to push through on your way back. Hanakaoo, known by locals as Canoe Beach, is a great hangout and Maui snorkeling spot. Canoe Beach is an eclectic mix: canoe clubs keep their outrigger canoes here, sea turtles are sighted frequently along the rocks on the left, and the beach park shares acreage with a cemetery. You can enjoy some good snorkeling and swimming off this beach. The BBQs are located on the left hand side of the park, along with picnic tables shaded from the sun. Wear slippers at this beach park – the kiawe trees drop sharp thorns onto the ground. This is one of the only west side beaches that has a lifeguard. Wahikuli Wayside Park is a fabulous place to hang out and to snorkel. There is a small stretch of sandy beach, but most of the park is made up of lawn with shaded picnic tables and BBQs. You are almost sure to see some sea turtles in the water here, whether you stand on shore or choose to take a dip and join them. Although the big draw at Wahikuli Wayside is the high number of sea turtles, you will also see Moorish idol, Achilles tang, brown surgeonfish, yellow tang, and perhaps even a pearl wrasse! You are highly likely to find sea turtles on either side. The beach slopes down a little abruptly into the water here, but the entry is a pretty easy one. When you first get in, swim out about 10 – 15 yards past the concrete slabs you’ll find; that will get you to the good stuff! Both sides (to the right and to the left) house rocky reef habitat, while the center is mostly sand. Baby Beach is a perfect hangout beach for the whole family. A long coral reef about 100 yards out usually protects the shoreline from any waves. Thanks to that reef, the ocean at Baby Beach is usually very calm and very shallow (1-2 feet deep). Wade into the water here to check out the fish and other marine life living around the coral heads. Enjoy looking, but please do not touch marine organisms, including coral. It is best to rent a beach umbrella to enjoy this location, as this end of Baby Beach has very little shade. If you walk about ¼ mile along the shore, you will find the Lahaina Jodo Mission. This Japanese Buddhist temple is a beautiful sight to see, and the temple grounds are open to the public. If you do want to walk north along the beach, bring slippers to protect your feet from thorns that have dropped into the sand from the kiawe trees. At Puamana, there is a small sandy beach on the left, but the real draw is the larger grassy area – it’s just perfect for hanging out. You will find picnic tables, BBQs, and trash bins, as well as Maui’s ever present Pacific Ocean views. The water comes all the way to the edge of the park here. Many surfers and stand up paddle boarders enjoy these waves. You’ll love watching both the waves and those riding them! If you need to rinse off at some point, the outdoor showers are on the far right hand side of the beach when you face the ocean. Launiupoko is a shady and comfortable expanse of ocean side lawn, with all the amenities you might need for hanging out. There is a nice path for walking, jogging, or skateboarding, and there is plenty of space on the lawn for games of Frisbee or catch! There are no sandy areas here. Trees cover much of Launiupoko, and a perimeter of lava rocks touches down to the sea. Depending on conditions, it can be a great surf spot for advanced wave riders. While you’re enjoying the area, see if you can spot any sea turtles hanging out near the rocks! Warning: Do not go barefoot at Olowalu. This beach is covered with a mesquite tree called kiawe that drops long, sharp thorns into the sand. The thorns can go through your slipper and into your foot, so step lightly. Olowalu is 450 acres of coral reef beneath generally calm waters, so it is an incredible snorkel site. Some of the corals are estimated to be 500 years old! Both Olowalu Beach and the reef along it extend for a few miles. You are sure to see parrotfish, sergeant majors, black triggerfish, goatfish, and ornate butterflyfish, among others. Several turtles (even the rare hawksbill turtle!) can be found swimming around and resting along the Olowalu reef. The discerning swimmer can sometimes find eels and octopuses, and several manta rays are known to spend time here. Because this reef system is so extensive, you can explore from left to right along the shoreline, and also out toward the open ocean and back again. To enter the water, look at the ocean from the shore, and find an underwater sand channel. Sand channels show up as a light turquoise color, while the coral reef looks dark from above. Get in at the start of a sand channel, and follow it out as far as you wish to explore. A sand channel is also a great landmark for finding your way back to your starting point. Once you are spent – and you will be at Olowalu; there is so much to see! – enjoy spending time on the sand and fallen tree trunks of this narrow beach. When you leave, if you are heading back to Lahaina, be very careful; making a left hand turn across traffic can be somewhat of a challenge. Charley Young Beach is a beautiful little sandy beach at the far north end of Kamaole Beach Park I. You can walk there from Kam I, and there is a nice lava peninsula that you can snorkel. The waves tend to run from gentle to medium strength here. This is also a fantastic place to watch the sunset, or simply enjoy reading a book. This beach is rarely crowded, and the parking lot is rarely full. Underwater, you will encounter plenty of sea turtles, manini, goatfish, parrotfish, trumpetfish, and some really cool sea urchins. While you are checking everything out, remember that everything you see underwater is alive, even the coral. Don’t touch the coral, and definitely don’t touch the turtles – you can get a huge fine, and doing so is disrespectful. Entering the water at Charley Young Beach is pretty easy. This is a sandy entry, but depending on what time of day you go snorkeling, the waves can be pushy coming in. If they are pushing you toward the beach, get past them as soon as you can. It is usually easier to gear up once you’re a few yards beyond those breaking waves. Snorkel as early as possible; the waves are gentler and visibility is best in the morning. Know your skill level and check in with your energy level before you go in, and use common sense while exploring these amazing reefs. All three of these beaches are lots of fun for the whole family. The generally calm waters are good for snorkeling, the parks offer all kinds of amenities, and there are many shops and restaurants nearby. It would be easy to spend an entire day here playing volleyball, cooking on the grill, exploring the reefs, and lounging on the sand or lawn. The lava fingers that extend into the ocean between each beach are the foundation for the reefs here. Getting into the water from a Kamaole Beach is easy. Just get in where it is sandy (almost everywhere), and head left or right. You’ll want to explore along the small lava peninsulas that jut into the water on either side of these beaches. This cooled lava is where the coral reefs have grown, and the coral reefs are where the fish and sea turtles conduct their business (it usually has a lot to do with swimming). Kamaole III snorkeling is best on the right hand side. Once you are finished in the water, you’ll love spending the day at one Kamaole Beach or all three! Among other activities, you can cook, eat, run around, play volleyball, use the swings, and build sand castles. Keawakapu is a nice, long, sandy beach with fairly shallow waters just outside a popular beachfront restaurant and resort. There is plenty of space to lie out on the soft golden sand, but there is no shade, so you’ll want to bring an umbrella. Driving south, Keawakapu is the last beach you’ll find before the Wailea beaches. You will be happy to see trumpetfish, sergeant majors, unicornfish, brown surgeonfish, and saddleback wrasses here. You will also be delighted to swim with humuhumunukunukuapua’a, butterflyfish, and goatfish! There is a good chance you’ll encounter a sea turtle or two, as well. The fish congregate around the lava fingers located on the right side of Keawakapu. When entering the water, find a sandy place and be sure to avoid the large rocks that are scattered about next to the reef. If you like, you can swim around this entire point and back. Sometimes the water can be rough, impeding visibility and pushing you quickly toward the reef. Know your skill level and energy level before going in, and use common sense while snorkeling. When you have finished snorkeling Keawakapu, or you want to take a break, hop out onto the sandy beach or the manicured lawn outside the resort, and relax. These two sandy beaches are separated by an excellent coral reef stretching out from shore. Ulua Beach on the left is a bit smaller than Mokapu on the right. Mokapu is directly in front of the Andaz Resort. Both beaches are are easy to walk along, and comfortable for the whole family. In these waters, you will find Moorish idol, humuhumunukunukuapua’a, surgeonfish, teardrop butterflyfish, and large schools of goatfish. There are domino damselfish, pencil urchins, and boxfish, too! If you’re lucky, you’ll be swimming when a Hawaiian green sea turtle passes by! The entry is sandy here, so getting in the water is usually easy. Anywhere you see a lava point extending into the water from Ulua and Mokapu, that is where the wild things are. 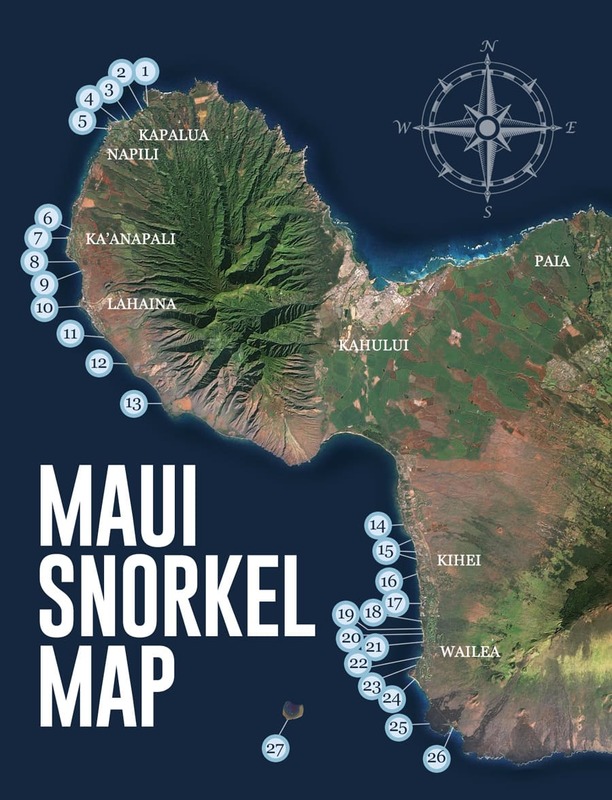 Talk to your snorkel buddy, choose a lava point, and head that way! Snorkel as early as you can. The waves are gentler and the visibility is best in the morning. Know your skill level and check in with your energy level before going in, and use common sense while exploring the beautiful reefs. This beach, right outside the Grand Wailea Resort, is gorgeous. It’s a lovely place to spend some time. For your convenience, there are two sets of outdoor showers. One set is near the parking lot, and the other is about halfway down the beach. The trash and recycle bins are halfway down the beach on the mountain (mauka) side of the flagstone path. The snorkeling here is okay. You’ll see butterflyfish, brown surgeonfish, Moorish idol, and humuhumunukunukuapua’a. There are red pencil urchins, sergeant majors, manini, and tetras, among others. Snorkel with your buddy as early as you can; the waves are gentler and the visibility is best in the morning. Rather than thriving along the coastline itself, the coral reef off Wailea Beach is found in satellite patches about 30 yards out from the shoreline and 20 yards to the right of the entry point. A sandy entry can be found on the right hand side of the beach. The challenge for you and your buddy is to negotiate the waves that are coming toward you as you first leave the beach. Once you get past the waves, swim forward until the water clears up, then turn right to find the reefs. When you exit, be sure to take note of the waves hitting the shore again. Polo Beach is a smaller stretch of sand just in front of the Fairmont Kea Lani Hotel. Like many Maui beaches, it is bordered on the back edge by the bright green naupaka plant. Small lava boulders buried in the sand give this beach some extra character. The waves here are gentler in the early morning, but they become better for bodyboarding later in the day. This site is all right for snorkeling. When you get in the water here, you are sure to see Christmas wrasses, sea urchins, brown surgeonfish, Moorish idol, and at least two types of triggerfish. You’ll also be swimming with chubs, manini, and sergeant majors! There is a good chance you’ll see sea turtles at this site. When you get in and out of the water on either side of Polo Beach, make sure to give the scattered rocks a wide berth. The entry is sandy, but the waves coming toward you can be pushy, so pay attention. Once you make it through those entry waves, you’re good to go. Head to the closest lava peninsula reaching from shore, and find some cool fish! When you are ready to head back to shore, keep those incoming waves in sight as you negotiate your way back onto Polo Beach. Po’olenalena Beach is a long, beautiful sandy beach – great for hanging out and for intermediate snorkelers; the water can be pushy at times. There is also an excellent view of Pu’u Olai, the volcanic cinder cone between Big and Little Beach. The upper part of this beach is covered with kiawe trees. If you are beneath those trees, watch out for fallen thorns in the sand. Both sides of the beach have excellent snorkeling along the nooks and crannies created by the lava rocks. You are almost sure to see sea turtles, the Hawaiian state fish, cornetfish, and saddleback wrasses. Also keep your eyes open for Moorish idol, pencil urchins, and one of the smartest fish in the sea – the brown surgeonfish! The entry is a gentle sandy slope on both sides. If you are going right, and you swim around the point, your exit will be easy: get out on the next beach and take the dirt path back through the lava rocks. If you go left and swim around the point, make sure to keep some energy in reserve; you’ll need to swim back to the beach you started on. If you decide not to snorkel, you will still have a great time at Po’olenalena Beach. There is plenty of beautiful space to run, play, and catch some rays! This is a gorgeous place! 5 Caves is also known as 5 Graves, for the small graveyard that is located next to the beach access path. This is a fantastic snorkel and scuba site – it could easily be described as the best on the island. You must be an advanced swimmer and snorkeler to explore 5 Caves, as getting in and out is a challenge, and it’s a long swim to get to the good stuff. If you are advanced, however, the time spent here is well worth it! Go in as early as you can to enjoy the best visibility. There are lots of turtles, plenty of fish, and some really great formations of rock and coral. If you scuba dive the site, there are several caves to explore. These caves are too deep for snorkelers to enter safely. You will see sea turtles, unicornfish (kala), butterflyfish, needlefish, trumpetfish, Hawaiian cleaner wrasse, yellow tang, soldierfish, goatfish, boxfish, and tobies. There are large schools of fish at 5 Caves. You are also likely to find nudibranchs, whitetip reef sharks, pincushion sea stars, whitemouth eels, and even scorpionfish! Entering the water here is interesting. Go down the beach access path and take the far right fork. This will take you to a tiny cove. On the right side of the cove there is a natural little “step” carved into the rock, just big enough for one person to stand on. You’ll get in and out here. It’s slippery, so stay safe! Once you’re swimming, head out of the cove and go left as far as you’d like till it’s time to come back again! There is no beach at this site, so plan to rest elsewhere after your honestly epic water time. This breathtakingly gorgeous beach is right in front of the Makena Beach and Golf Resort. There is a small lawn on one side. A set of concrete steps lead down to the sand. This is a nice beach to hang out on, and the snorkeling is just great. Underwater on both sides, you’ll see all kinds of colorful fish including needlefish, manini, brown surgeonfish, and more! There are often sea turtles spotted here as well as the Hawaii state fish: the humuhumunukunukuapua’a. Enjoy exploring the reefs that have built on the lava that cooled here so many years ago. Just an FYI: coral is a colony of animals. In Hawaii, coral can grow – at most – about one inch per year. Getting into the water is simple from this beach. Almost every spot offers a sandy entry. While swimming at Maluaka Beach, do not try to explore around the rocks that are close to shore at the very center. It is too shallow there to be safe, and you can easily get pounded into the rocks by incoming waves. Big Beach – also known as Oneloa Beach and Makena Beach – is one of the most fantastic sights on Maui. There is no wider or longer expanse of sand on the island, and the water there is almost indescribably beautiful. We do not recommend swimming or snorkeling in the lovely water here. Big Beach is one of the few south side beaches watched over by lifeguards. Many people have been taken by surprise by the strength and power of even small waves here, resulting in injuries and fatalities. It is best to simply fall in love with this water from afar while you spend time on the sand. Ahihi-Kinau Natural Area Reserve protects both the sea life and the bird life in the area, so you’ll find bigger fish here than you will at many other snorkeling sites. Ahihi Bay itself is small and beautiful, and it opens up into a much bigger, lovely marine area. Both the bay and the water beyond it are generally easy to snorkel. Beneath the surface at Ahihi-Kinau, you will see brown surgeonfish, peacock grouper, parrotfish, black triggerfish, sea urchins, and large schools of manini. This reef is a fish nursery, so you are sure to see some cute baby parrotfish, along with other little ones. There is a good chance you’ll run into some sea turtles, eels, and spotted eagle rays, as well. You’ll love what you see underwater at Ahihi-Kinau. Your best entry point is on the right side of the bay. There is a sort of concrete platform there, in about six inches of water. Once you’re all set, you don’t have to leave this small bay to see a lot of fish. If you do swim beyond the bay, you can travel in either direction. Both ways are gorgeous, with plenty of coral reef to explore. Ahihi-Kinau doesn’t sport a sandy beach, so keep that in mind while you plan your entirely beautiful Maui day. La Perouse Bay is named after the first European to set foot on Maui – Jean-Francois de Galaup La Perouse. This French explorer was only in the Islands for 48 hours, and we certainly hope your vacation is longer than that! Today, the bay is well known as a daytime resting place for a pod of Hawaiian spinner dolphins. The ocean here is frequently rough and – though beautiful – not safe at these times for snorkeling or swimming. Even when the ocean is calm, the visibility is not great, so La Perouse is only recommended for advanced snorkelers. The best time to try is in the early morning, around 8:00 am. There is a great hiking trail off to the left over the lava! If you hike, bring lots of water. Snorkeling at La Perouse Bay, you will see Moorish idol, yellow tang, convict tang, sea urchins, aholehole, blennies, domino damselfish, and many others. If you are very lucky, you will be approached by dolphins! Make sure to let them come to you rather than going to them, and absolutely savor the moment. To enter La Perouse Bay, wear shoes as you pick your way down the lava to the right of the parking lot. Go past the fence there, and bear right. Get into the water near the sign that says “Conservation Area,” and swim to the left (to the right is a former Hawaiian fishpond, and private property). The bay is shallow when you get in, but it reaches depths of up to 80 feet. Exit in the same place. La Perouse doesn’t have much of a beach, as the area is made of rough and sharp lava. Technically, you can bring chairs with you and hike to some sandy spots, but we recommend you visit a more comfortable beach for hanging out. Big Beach, as one suggestion, is close by and very comfortable. Turtle Town is named for the abundance of sea turtles that rest and feed near this coral reef. The reef is extensive and spreads out in all directions. When you take a boat out to see Molokini Crater, Turtle Town is usually your second awesome snorkel site for the day! When you are exploring underwater at Turtle Town, you will definitely see Hawaiian green sea turtles. You will also see some beautiful fish including yellow tang, Achilles tang, chubs, saddleback wrasse, and sergeant majors. Also look for Moorish idol, the well-known Hawaiian state fish, and the fabulous parrotfish! If you don’t see any turtles at first, remember that many could be resting on the bottom of the sea. When you do see one, it will be an exciting moment! Make sure you give the turtles plenty of space to swim and breathe – just like you’d appreciate, if you were a famous underwater icon! Your boat crew will tell you the best ways to enter the water from the boat. They’ll also explain how to use the snorkel equipment and flotation devices provided, and they’ll be happy to answer any questions you may have. Once you’re out of the water at Turtle Town and back on board the boat, rinse off with the freshwater shower, grab a snack and some drinks, and enjoy making more memories! We suggest the Malolo Molokini & Turtle Town snorkeling adventure for the best all around time. Okay, so this isn’t actually a beach. In fact, it is not even part of Maui. Molokini Crater is a volcanic caldera located three miles off the Maui coast. The only way to get there is by boat, but it is some of the best snorkeling available anywhere in the world. Visibility often reaches 150 feet. There are many choices for taking a boat tour to Molokini, but we suggest the Malolo for the best all around time.